Captain’s Quarters Resort is perfectly positioned in the heart of Myrtle Beach to offer tons of different options for guests looking to get some Irish-style fun in during their stay. 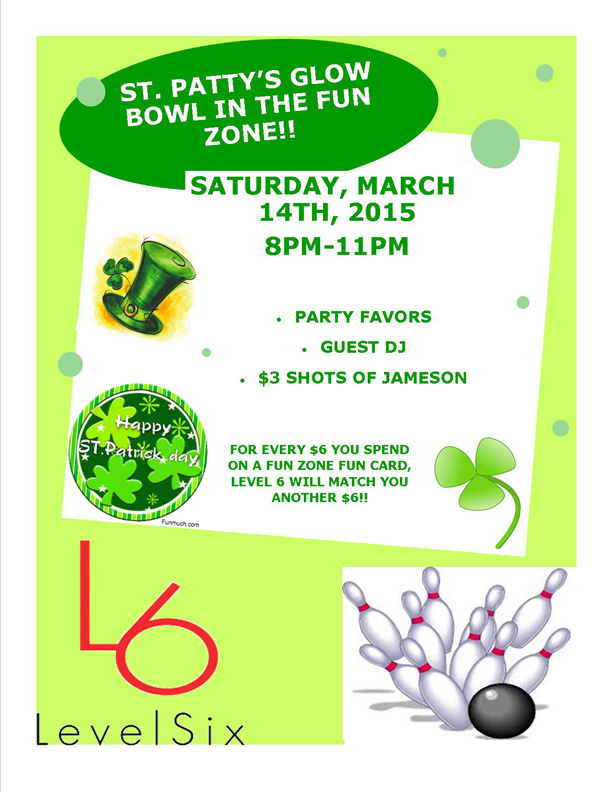 On Saturday, March 14 we will be hosting a St. Patty’s Glow Bowl Party at our Level 6 bowling center from 8 p.m. to 11 p.m. We’ll have party favors, a guest DJ and more! This event is open to the public and is sure to be fun for all! If you want to celebrate on St. Patrick’s Day, March 17, then stay here with us and celebrate at our very own Loco Gecko Beach Shak! We will be serving up tasty drinks along with green chips and salsa, plus our regular delicious menu of burgers, wraps and pizzas. Stop in for one of our $5 drink specials or grab a shot of Jameson Whisky for just $3. We’ll also be serving some fun green drinks including the Shamrock-Rita and the Green Shamrock. Downtown Myrtle Beach St. Patrick’s Day Celebration is a local and visitor favorite. This year it will run not one, but two whole days! Join in the fun from 11 a.m. to 10 p.m. on March 14 and from noon until 9 p.m. on March 15, 2015. Set up right near the Boardwalk, this family-friendly festival will feature a three-block stretch of live music, food and drink vendors and a kids’ carnival. Kids will love the petting zoo, camel and pony rides, games and carnival rides while adults will enjoy the variety of beer and Irish food options available. This event is free for all and easy to find thanks to the hundreds of festively adorned visitors and locals, as well as vendors and the sounds of bagpipes and other Irish themed music. Plus, guests at Captain’s Quarters Resort don’t have to worry about finding a way to get to the festivities. Those who don’t mind a bit of a walk (about a mile and a half if you're leaving directly from the resort) can get there easily and enjoy some of the sights of downtown Myrtle Beach on the way. Another popular nearby festival taking place the weekend before St. Patrick’s Day is the 6th Annual Irish Fest at Valor Park. This Market Common event will run from 11 a.m. to 7 p.m. on March 14, 2015. Great for families, this Myrtle Beach festival will feature Irish food, beer, live music, vendors and a variety of activities for the little ones including face painting and inflatables. You can visit the Captain’s Quarters events page for more details on these and other Myrtle Beach events!